Every November, I wonder whether I’ll have the nerve to attempt NaNoWriMo (National Novel Writing Month) or NaBloPoMo (National Blog Posting Month). With the first, I’d commit to write a novel during the month of November, or, at least, commit to daily writing with word count goals. With the second, I’d commit to writing a blog post daily for the entire 30 days of November. No. The answer is no. I don’t have the nerve, nor the stamina. But here it is, November already, and I’m putting fingers to keyboard. Just one blog post. It’s a baby step toward what I really want to be writing, but I’m okay with that. A couple of weekends ago, the weekend before my birthday, I attended a workshop in NYC on narrative medicine. I left my family at home and spent four nights alone in a hotel in the Upper West Side, a queen-sized bed and a bathroom all to myself. I was able to connect with some dear friends in the spare moments before the conference started, and oh, how wonderful were those moments. It felt so great to be with these women again — sharing a meal, sharing stories, feeling supported. On day one of my workshop, when I opened my welcome folder with the weekend’s itinerary, I found a small, red Moleskine notebook, blank and ready to be filled. I smiled to myself when I saw it, and I was happy I remembered to bring my favorite pen. As heralded by that blank notebook, writing was a big part of the workshop format, with writing prompts and other writing activities scattered throughout each day, and with small groups where we both wrote and read our writings aloud to those in our group. The focus was not on critiquing each others’ writings but instead on listening to the words and paying attention to the meaning of the words. I loved every single minute of it. I felt selfish, being alone in New York City in October, with chilly weather and leaves in shades of orange fluttering in the breeze, in a beautiful hotel near Central Park, spending my hours reading and listening and writing, eating wonderful food with friends and sometimes alone (both of which I adore). I felt selfish and lucky and happy and inspired. And now let us flash forward to two weeks later, to the first day of November. Have I written much since returning from my workshop? Not much, but I’ve written. I’ve been carrying my laptop with me daily, and I’ve found some new places to write, as well as some different times of day in which to do it. Life has intervened, as it does, and there has been drama and tears and and fear and angst – but this is the nature of life, no? I have even baked since returning, but only just once. 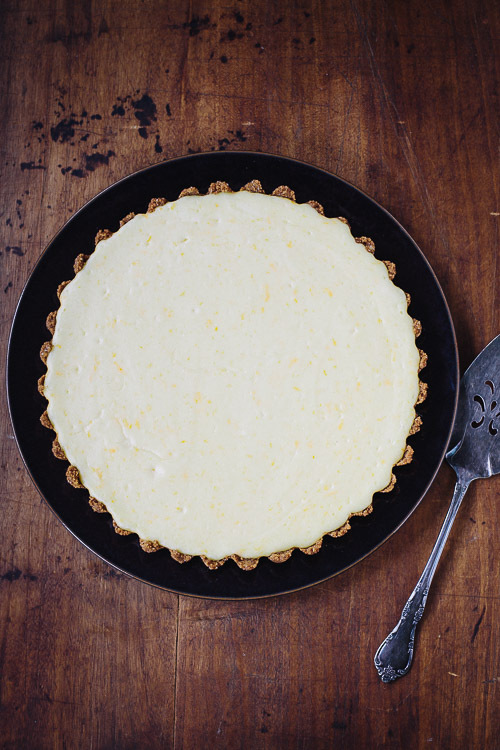 I baked this gorgeous orange ricotta tart, and oh how wonderful it felt to blend and mix together these ingredients, so simple on their own yet so magical when combined in this way. And here it is November already, and I have just completed my first blog post in entirely too long. Baby steps, dearest friends. Baby steps. This tart recipe comes from the amazing Abigail Johnson Dodge in Fine Cooking, Issue 68. I've tweaked the recipe by making a Biscoff cookie crust, but the orange ricotta filling is all hers. Heat oven to 350 degrees, with rack in middle position. In a medium bowl, stir together the ground cookies and sugar until well blended. Add the melted butter and stir well, until the crumbs are evenly moistened. Pour the crumbs into a 9 inch (or 9-1/2 inch) fluted tart pan with a removable bottom. Using your fingers, press the crumbs evenly over the bottom and partway up the sides of the tart pan. Press the crumbs firmly in place, making an even layer. Bake the crust until fragrant, about 10 minutes. Allow the baked crust to cool completely on a wire rack. If oven is not already heated, heat to 350 degrees, with rack in middle position. 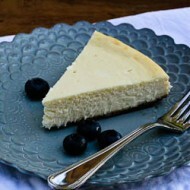 In a medium bowl, combine the ricotta and cream cheese. Using an electric mixer, beat on medium speed until well blended and no lumps remain, about 3 minutes. Add sugar, flour, and salt, and continue beating until well blended, about 1 minute. Add egg yolks, orange zest, and orange liqueur. Beat until just incorporated. Scrape the filling into the cooled crust, using a rubber spatula to spread the filling evenly. Bake the tart until the filling barely jiggles when the pan is nudged, 30 to 35 minutes. 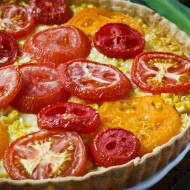 Let cool completely on a wire rack, then refrigerate the tart in the pan until fully chilled and firm, 2 to 3 hours. First off – NOT selfish to cook for yourself!! It’s important to nourish/love ourselves in the same way we’d do for others – and I’m pretty sure you’d bake a dessert like this one for a friend who was having a tough time. Second – IT’S GORGEOUS! And who wouldn’t want to eat this after long hours – I’d eat the whole thing all by myself (which is why I don’t bake often!) You’re doing fine! Smith Bites is right–it’s not at all selfish! I love a good fruit crisp, and yours looks delicious! I like the combination of fruits that you used. Warm fruit crisps like this are the most satisfying! Eat to your hearts’ content. I understand that need. It is just perfect for a hot summer day. just hearing the words ‘fruit’ and ‘crisp’ together makes my mouth water. oh, the crunchy topping is my favorite part. Reading this post made me realize that a fruit crisp is exactly what I need to alleviate my stress. Sometimes the only thing you can do is make something to feed your soul, no need to feel guilty about that! I love the posting, as I am reading and looking at the pics I am thinking “sounds good, sounds great” then you share the final picture with the ice cream with it and Oh man–it looks so–perfect! 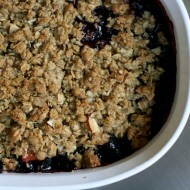 Ahhhh… summer fruit crisp. So simple to make and yet so flavorful! You are not selfish at all for wanting to satisfy a food craving. I would have done the same thing… thankfully, I have a husband who loves a good crisp and would help me eat it. Loving all the fresh fruit that’s available right now – perfect just to eat or make into a cobbler! Yours looks lovely – I am sure your hubby didn’t mind picking up fruit when you turn it into something like this!